Amidst the sea cliffs on the Orcadian Mainland's east coast, lies a deep sea-cave known as The Gloup. With the roof having collapsed many years ago, this rugged chasm is now home to nesting seabirds, while a colony of seals live nearby. 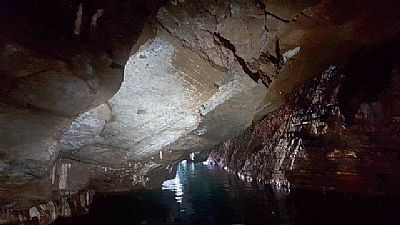 There is no better way to explore the cave than by boat, as long as you have one small enough to navigate the intricate crags of the cliffside. The RSPB Local Group will be running two such trips during the Nature Festival, so take this opportunity to enjoy a natural and geological wonder. Places are limited and booking in advance is essential. Please note that this event is suitable for people aged 7+ and is particularly weather-dependent. 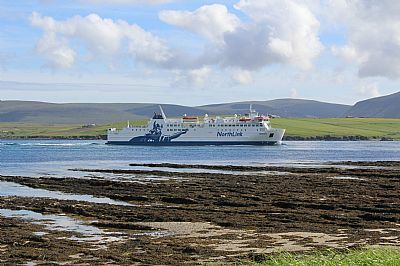 The grand finale of the Nature Festival: Northlink Ferries are running their always-popular nature cruise on Sunday 19th May. Sailing on the MV Hamnavoe, we will make our way up the west coast of Mainland Orkney, giving those aboard spectacular views of the island and surrounding seas. For nature enthusiasts, there will be a plethora of seabirds including razorbills, guillemots and fulmar, while we might even be lucky enough to spotdolphins and whales. There will be plenty more to see as well, such as the remarkable cliffs at Yesnaby, and Skaill Bay, which is home to the ancient village of Skara Brae. If the conditions are good enough, we aim to make it all the way to the Brough of Birsay. On top of all that, there will be a number of activities on board, including whisky and gin-tasting, craft displays and a raffle with some excellent prizes.